Inder Loves Folk Art: Linen and calico. 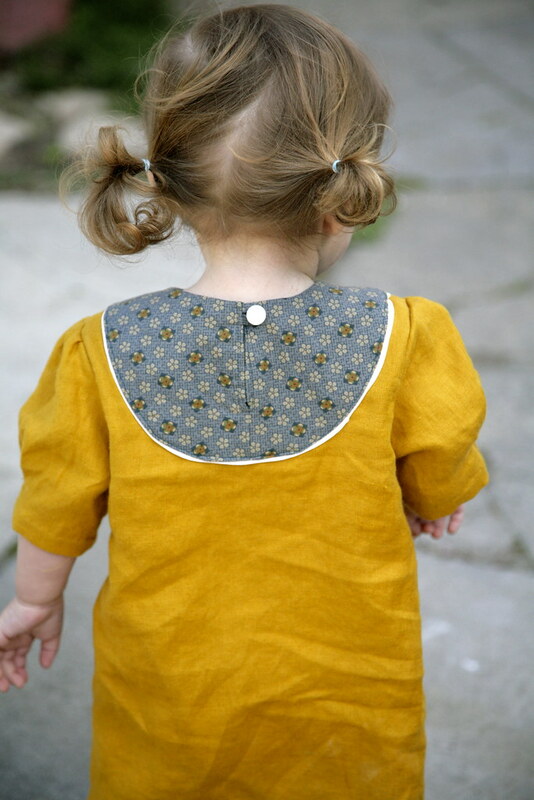 Still trying to justify those new Oliver + s patterns which are currently on their way to my house! 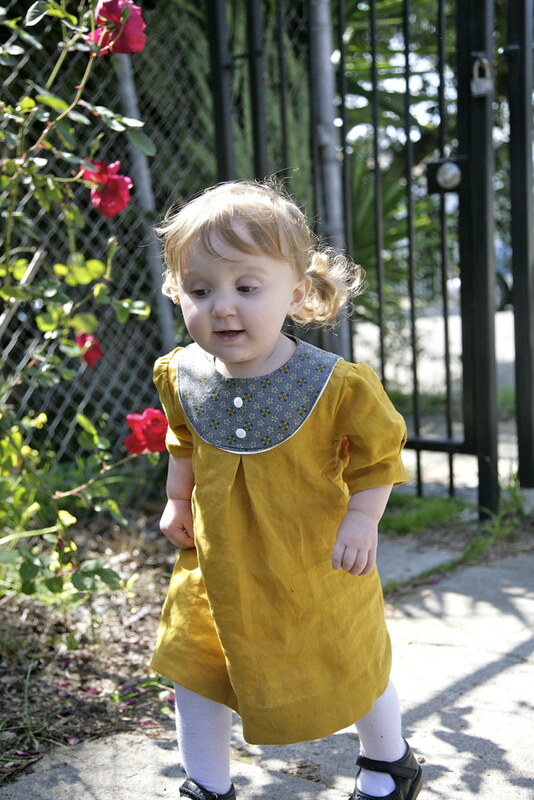 Working through my o+s stash - this time I sewed up the Playdate Dress (not to be confused with the Playtime Dress and Leggings). This is a lovely, vintage-inspired dress with a little bib, flat bias piping, and little pleats on the sleeves and center-front. It is so old-fashioned and darling - right up my alley! 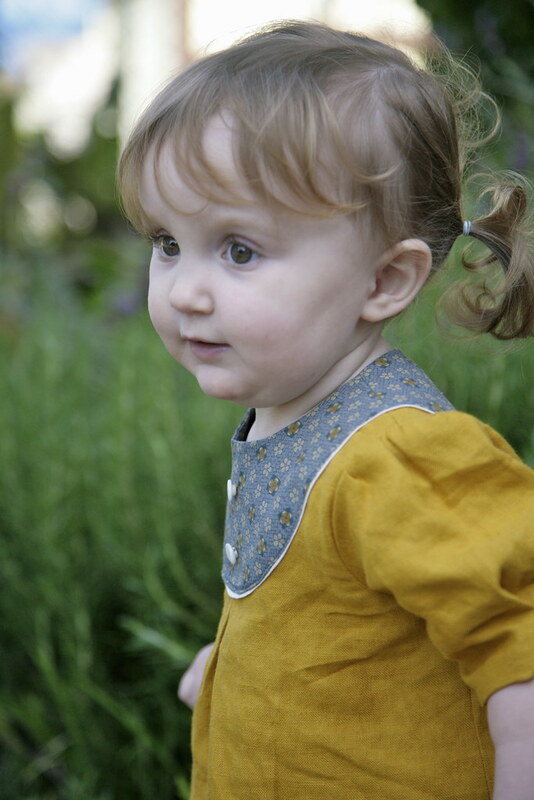 My choice of fabrics - mustard yellow linen with a sepia/blue calico for the bib - were strongly inspired by this beautiful linen version and this pretty yellow dress with floral print bib. I used storebought ivory bias tape for the flat piping around the bib. Sewing on that bib is a bit tricky, to be sure (that's how this pattern earns its 3 scissors rating), but I followed Nicole's wonderful tutorial and I have to say, it came together quickly! Ah, I love sewing with linen. I know the wrinkles bother some people, but I love the rumpled look, and it is incredibly durable stuff. And like chambray and pinwale corduroy - everything just looks wonderful made up in linen. It does require a couple tricks, however. To avoid the loose weave shifting around too much during the construction process, I handle the pieces as little as possible. I staystitched the neckline of this dress pretty much as soon as I cut it out, because I knew it would want to warp and stretch and fray all over the place. And I have to confess, even with serging, the inside of this dress is a bit of a mess. Well, that's linen for you. It looks so beautiful on the outside, we'll forgive its minor faults. I also crank my iron up to the highest setting and use lots of steam in pressing. But here's the thing - if you iron the linen directly on the right side of the fabric, it has a tendency to get shiny. So I press from the inside, or use a pressing cloth. And by "pressing cloth," I mean "random scrap of quilting cotton grabbed from my scrap box." I opted to keep the bib simple, and skipped the little ruffles. There was enough going on with this dress without them. I hemmed the bottom and hem by hand to add to the old-fashioned vibe. I wasn't sure I would love the fullness of the sleeves, but oh, I really do! The little pleats are to die for. Messy pigtails! So cute. And I really can't ever seem to get enough of mustard yellow. Such a luscious, rich shade. And she's off! Maggie is such a busy girl! 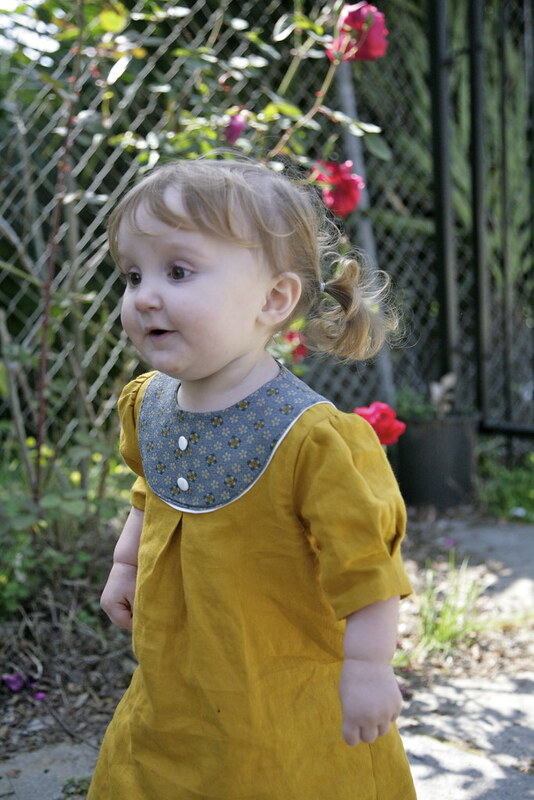 This may end up being Maggie's Easter dress, although I realize a lot of people would find the colors more autumnal than vernal ... we'll see if I make anything even more Easter-y between now and then. I am taking Monday off as a furlough day, and I have big plans for this long weekend. As part of "Operation: Take Control of My Life," a.k.a. "Something's better than nothing," I have plans to revamp our bedroom, which all four of us are currently sleeping in (long story, partly a choice and partly a housemates sleeping in all of our bedrooms thing), upgrade Joe to a "big boy bed" (he's almost five! ), move the furniture around to improve function, and generally spruce it up. It's not going to be Better Homes and Gardens, but hey, something is better than nothing, right? What are your plans for the next week, sewing or otherwise? Eeeep, I love it. Every thing is perfect. I adore mustard too, such a great colour. Thank you, Nicole! Your instructions were great, as always! I love this pattern so much, and your version is so sweet! It makes me think a bit of Little House on the Prairie. It's that lovely calico. I think it's actually a repro print from the 19th century, hence the pioneer vibe! Thanks, Masha! Also a big fan of linen. And mustard. 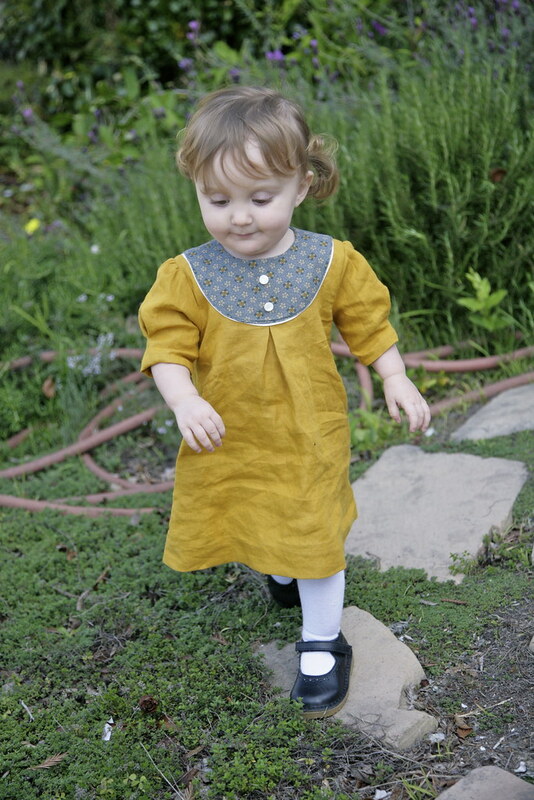 This is such a sweet dress - I so wish my daughter could fit into this pattern. Thank you Suzie! Yes, I can never ever get enough (1) linen; (2) mustard; and especially (3) mustard linen! Awww, this is one of my favourite things you've ever made: just perfection! I love mustard yellow too! Aw, that is high praise indeed! Thank you! I love this dress you did an excellant job! She is such a beautiful girl and I think the mustard is a great color on her! Thank you Rachel! That is a major, major compliment! Lovely! And my trick for neat linen finish -french seems. No fray visible! Yes, indeed! The bib construction on this dress doesn't allow for french seams, unfortunately. I briefly considered binding the edges in bias, but HAHAHAHAHAHAHA, ain't nobody got time for that! (Actually, some people do have time for that, and I greatly respect them - but not me.) So, messy it is! Ah, yes, I made this just for my currently autumnal Aussie friends! :-) Yes, I love Maggie in those little shoes. Most of the time she's barefoot or in sneaks, but I break these out for "special occasions." Look at you banging through all your old Oliver and S patterns! I'm in impressed! This is such a sweet little dress! I love the look of the linen! And apparently Maggie loves it too since she's running around in each picture! Such a joyous bundle of energy! Can I have some of it?? Thanks! I'm about ready to call it and start working on the new patterns instead, but it has been fun and I feel a little better about my bulging pattern stash! Maggie was definitely having fun running around for this shoot. I think we all wish we had a little "Maggie energy" in our lives! So adorable! As is your daughter with those pigtails. 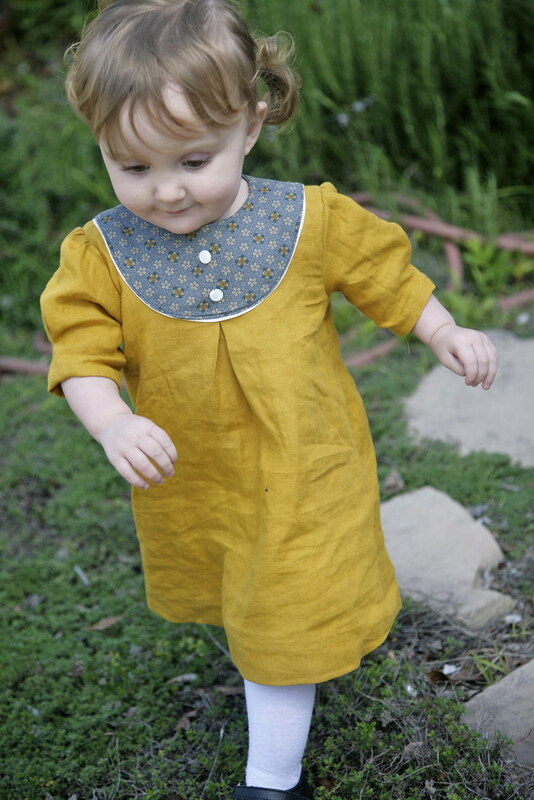 I love that mustard color too - I'm making my little one a dress in the same color.